Otesha needs a new chair of our board of trustees, to take on the challenge of leading a non-hierarchical organisation. We’re looking for a chair with excellent facilitation skills, who’s into making non-hierarchical organisational structures work and supporting charities in a strategic and governance way. Although the staff team at Otesha has a flat structure, as a charity we still have a board who have overall responsibility and so need to approve, and take responsibility for, all the big decisions.The board ensure the charity is well run and support our staff team to achieve Otesha’s aims.The chair will take on additional responsibilities of facilitating board meetings, ensuring the board acts well as a team together and being a spokes person for the organisation. Otesha mobilises young people to adopt more sustainable lifestyles and become inspiring leaders on climate change, social justice and ethical consumption. Since 2007 we have worked with thousands of young people aged 11-28 from a diversity of backgrounds across England, Wales and Scotland. We work with young people and schools; organise educational cycle tours around the UK which resemble a two-wheeled sustainability circus; and work to combat growing youth unemployment by helping young people find their way into fair, decent and meaningful green jobs. If you think this is you, but aren’t totally sure about it, email me (jo@otesha.org.uk) and we can arrange a time to chat about it. Please note: The Otesha Project UK is an equal opportunities organisation and encourages applications from underrepresented groups. We do not discriminate on the basis of ethnicity, place of origin, class, citizenship, system of belief, gender, sexual orientation, language, marital status, family status, physical and/or mental disability. However, all employees (and trustees) will be chosen on merit. Six Months on from the ‘Green and Decent Jobs’ Report at Otesha. 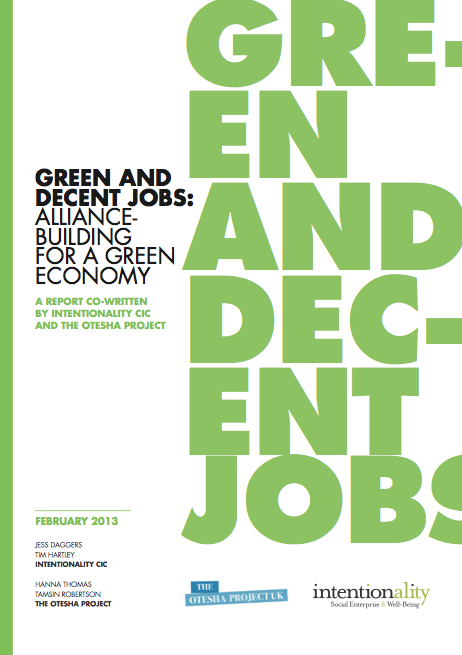 Back in February 2013, Otesha joined forces with Intentionality to launch the ‘Green and Decent Jobs’ report reflecting on Otesha’s experiences delivering their Green Jobs Programme. The initial plan was to follow a pipeline model, guiding participants through training, work experience, environmental literacy and ideally towards employment. Otesha tried to create connections with the renewable energy construction industry to underpin the development of participants. The report describes the barriers that were overcome and the important lessons learned. The Green Jobs programme has since evolved from this formative experience, and now largely flies under the banner of ‘Branch Out’, as well as broader campaigning through the East London Green Jos Alliance and our Roots of Success course. The report found that a significant barrier to the Green Economy’s growth has been the uncertainty surrounding national policy. Unfortunately this remains the case with the blocking of the Energy Bill’s decarbonisation amendment. However, this has not stopped Branch Out from reaching young people and making successful connections with like-minded organisations in Hackney that aim to provide these people with skills, training and opportunities. A switch in the course’s emphasis from construction to horticulture has been key. Once a week, the participants attend a session at St Mary’s Secret Garden working towards a City and Guilds Level 1 Award in Practical Horticulture Skills. Additionally, there have been trips to induction days at Streetscape and Cre8 Arc for the participants to gain some work experience. Overall, the horticulture sector seems more receptive to cooperating. This is perhaps due to being less dependent on long-term investment that is required for growth in the renewable energy construction industry. Although gardening and growing healthy food sustainably is close to our hearts (and stomachs) at Otesha, Branch Out offers much more. In fact an impressively comprehensive suite of courses have been organised. Throughout the 12 weeks that Branch Out runs, there are sessions in the kitchens at Made in Hackney; there is the accredited Roots of Success environmental literacy course; employability skills workshops; finance and money management sessions with MyBnk; individual mentoring sessions with Otesha’s Green Jobs Programme directors; and the option to be assigned a mentor once the participant has completed Branch Out. Best of all, the course can be shaped by the participants themselves who are encouraged to suggest ideas for trips and talks. In the 6 months since the ‘Green and Decent Jobs’ report, Otesha’s Green Jobs programme has come a long way. We have a full compliment of activities, a dedicated network of supporting organisations, and most importantly, participants with loads of enthusiasm. Our first batch of graduates have gone onto further horticulture training, and various other apprenticeships including solar panel installation. Otesha are welcoming applicants for one more Branch Out in 2013, and three in 2014. Since leaving the Otesha staff team in 2012, I’ve been on the board of trustees. So far it’s been pretty good: I’ve kept in touch with my Otesha friends; still had a say in the development of the organisation; worked alongside other trustees from backgrounds I wouldn’t come into to contact with in my usual life (like lawyers); eaten a lot of biscuits and humous (not together) and learnt loads. We’re looking for more fabulous people to join our board of trustees. Although the staff team at Otesha has a flat structure, as a charity we still have a board who have overall responsibility and so need to approve all the big decisions. We’d particularly like to sit round a board table with people who bring some relevant skills but are also wanting to develop new ones by being a trustee, for example you could be wanting to learn more about the charity sector and bring skills from another sector. So it’s a real commitment, but one that shouldn’t be too scary, and the effectiveness and dedication of the board members has a real impact on Otesha. Board members have the opportunity to make a positive difference to Otesha and to the people we work with, and a contribution towards our aims. And if we all do it well, we won’t be bored in board meetings. In 2010 The Otesha Project UK started to deliver their first Green Jobs Programme for young, unemployed people in East London. Intentionality CIC and Otesha have undertaken joint analysis of what can be learned from this Programme, drawing on Otesha’s experience over the last two years combined with Intentionality’s interviews with key stakeholders and background research about the wider political and economic context. for policymakers at a regional, national and international level. Our nine recommendations are aimed primarily at local groups engaged in creating green jobs, or thinking about doing so. Please circulate the report to friends and colleagues – and if you can promote it on social media and blog about it, we’d be hugely grateful. As we slide into a triple dip recession, the picture for many of the UK’s young people is bleak. It is time for us to match the people that need the work, with the work that needs to be done. GREEN JOBS ARE A-GO! Grow your way to a green-fingered career on Otesha’s newest programme -‘Branch Out’! Want to work outside, get some environmental qualifications and find a great green job at the end? Then join our 1st programme from April- June in Hackney! Branch Out is totally FREE and open to ALL 16-25 year olds who can travel to East London 2 days a week. If you, or someone you know, wants to join this course and find work then get in contact with Tamsin by emailing tamsin@otesha.org.uk or calling 020 3609 6763. Registration deadline March 18th 2013. Western Quest goes West Country proper! After a wonderful stay at the West Town Farm in Ide, Exeter, it was sadly time to move on and head further West to the gorgeous hilly countryside of the Dartmoor National Park. After a difficult start to the ride (anyone who knows the giant hill to Dunchideock leaving Ide will know what I am talking about) the rest of the 20 miles to Ashburton were relatively flat and really beautiful, a wonderful ride. On arrival at The Husbandry School, a few miles outside of Ashburton, we were greeted by yet another steep climb to the farm itself but were rewarded by arguably the best view of the whole Western Quest cycle tour at the top. Thanks to Jonty and Carole we immediately felt welcomed and at home on their lovely farm and were treated to the luxury of a bath and comfortable night’s sleep – much appreciated with an early start and hilly six mile cycle to Landscove primary school the next morning. Despite our fears, the six mile cycle across the Devonshire hills to Landscove raced by at 8am, due to the lack of trailers, tents and panniers weighing us down. We were immediately welcomed at this small but friendly rural school in Landscove and enjoyed performing our play to the whole school. Although the play is aimed at students aged 8 and over, the years 1 and 2 really seemed to enjoy it and some of the songs had the best audience participation of the whole tour – a great start to the morning. After the play we split into two groups and led workshops on transport and energy. The school were impressively already taking many ‘green’ measures, such as an energy saving campaign and signs around the school informing us to switch appliances off when not in use, a small allotment in the playground where students were learning to grow their own vegetables and school lunches made from ingredients from a local organic farm. The students were therefore very receptive to our workshops, which seemed to both refresh and embellish ideas on what action we can take in our everyday lives to be more sustainable. The energy workshop was interesting to build on the work the school was already doing and the students enjoyed energy charades and were very surprised at which electrical appliances use the most energy. After doing an energy audit of the school the students had many great ideas on how we can continue to reduce our energy consumption, at school and at home, which we were really pleased to hear. The transport workshop with year 6 also went well, with students eagerly learning about different forms of transport and which are least polluting. As a result of the workshop many students pledged to use public transport when possible and car share to school with people who lived near them. They also said that they felt more confident to maintain their bikes, which we were really happy with. All in all, we had a great experience at the small but pro-active and welcoming school, which was really interesting both for the students and us. We happily left the school to meander back to The Husbandry School, along the country lanes in the September sunshine, filling our tupperwares with blackberries as we went; a wonderful and inspiring morning’s work. We always knew that Charlie would only be with us for half of the tour, but the moment of her departure had seemed so far away. With sad faces and heavy hearts, we bid her farewell in Bristol. But of course, this being an Otesha tour we were going to celebrate and not cry about the loss of one of our members! So the cooking team got to work on a 5 course feast made up of local ingredients from the fabulous Feed Bristol, where we were staying, and the Bristol Sweetmart. One thing we’ve all taken out of this tour is how easy it is to cook healthy, local and organic food on our budget of 5 pounds per person per day. As we’re promoting a sustainable, local lifestyle, it’s important to us that we walk the talk. Our food mandate means we’re eating vegan food that is from the UK, or the EU if it can’t be grown in the UK, and we’re avoiding soya and palm oil. We buy most of our foods from the farms we stay at or the nearest farm shop and local greengrocers and wholefoods shops. At first, wading through the packaging was hard work – just because something says it’s ‘made in’, ‘manufactured in’ or ‘produced in’ Britain, does not mean the ingredients are British. So we check for signs saying EU agriculture and use our common sense to decide if products are likely to be British. Unless we’ve got it all wrong and cumin seeds do grow in Guildford, we’re hoping we’re doing okay… and all without a supermarket in sight. Woo! For Charlie’s leaving party, we enjoyed a wonderful meal of homemade houmous, English melon, Italian olives, local curried vegetables, tabbouleh, beetroot and green salad and blackberry and apple crumble. After a delivering our workshops and performances all over Bristol, we rode on to our next stop in Chew Magna. We arrived later than expected due to two punctures and a burst tyre but we timed our arrival perfectly to see the sun set over the pituresque Chew Valley lake where we set up our tents. We were staying at The Community Farm and were greeted by the lovely Claire and the infamous mid tour retreat package from the Otesha office. As expected, it contained a lot of postcards to spark pupils’ individual actions, ideas for the retreat and a big bar of chocolate. Less expected were wonderful, positive messages from the Otesha team, thanks guys! We contemplated the previous two weeks, what we had achieved, what we hadn’t, what we wanted to get out of the next few weeks and the Otesha experience as a whole. We then reconvened to chat over our thoughts and celebrate the tour so far with ‘The Great Big Pat on the Back’ where we counted up miles cycled, projects visited, punctures, best views, and highs and lows in general. The second day was more relaxed and began with volunteering on the Community Farm, with jobs ranging from picking cucumbers to pruning raspberry bushes. We then had a wonderful feast with all the volunteers, well deserved after a morning’s work. The Community Farm, a co-operative vegetable box scheme farm seems to be really established, despite being in its early stages. We were treated to a tour of the farm by Ben and heard about big plans for the new education centre, where numerous courses will be run, ranging from foraging to bee-keeping, so if you are interested and in the Bristol area watch this space. We had a wonderful, relaxing, mid tour retreat, thanks to the Otesha team, the Community farm and the beautiful weather. It was a great chance to reflect and re-cap on our play and workshops, thoughts and aspirations, which helped us to feel prepared to enter schools; the next phase of the Western Quest tour.